﻿ HuntingNut » Forums » Firearms, Shooting & Reloading » Reloading Ammunition » drop tubes, how do they work? drop tubes, how do they work? Posted: Thu Nov 14, 2013 3:17 pm Post subject: Re: drop tubes, how do they work? Posted: Thu Nov 14, 2013 8:15 pm Post subject: Re: drop tubes, how do they work? Posted: Thu Nov 14, 2013 8:51 pm Post subject: Re: drop tubes, how do they work? Posted: Sat Nov 23, 2013 8:51 am Post subject: Re: drop tubes, how do they work? 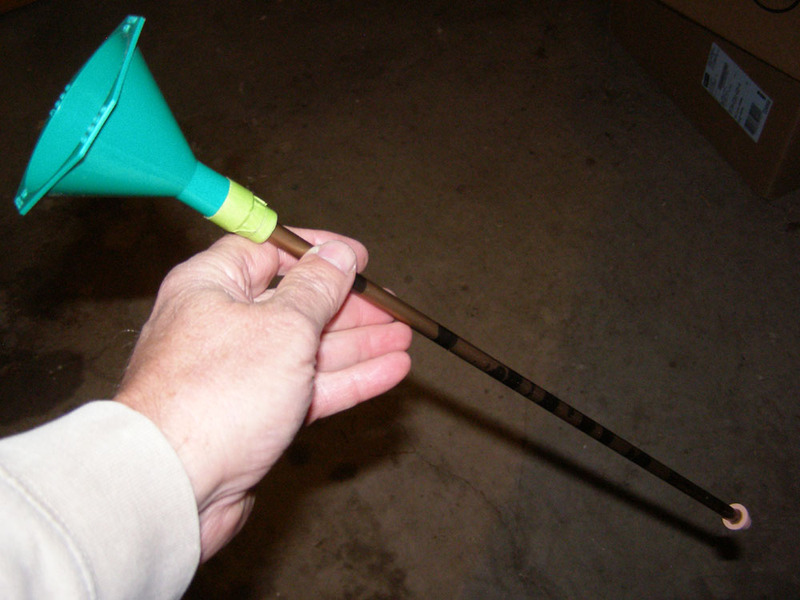 I had some arrow shafts that were 2117 alu. They are just a hair bigger than the neck of a .270/6.8 case. So, I fabricated a 16" drop tube with an RCBS funnel and a rubber cap that keeps the tube directly over the case mouth. It worked very well. 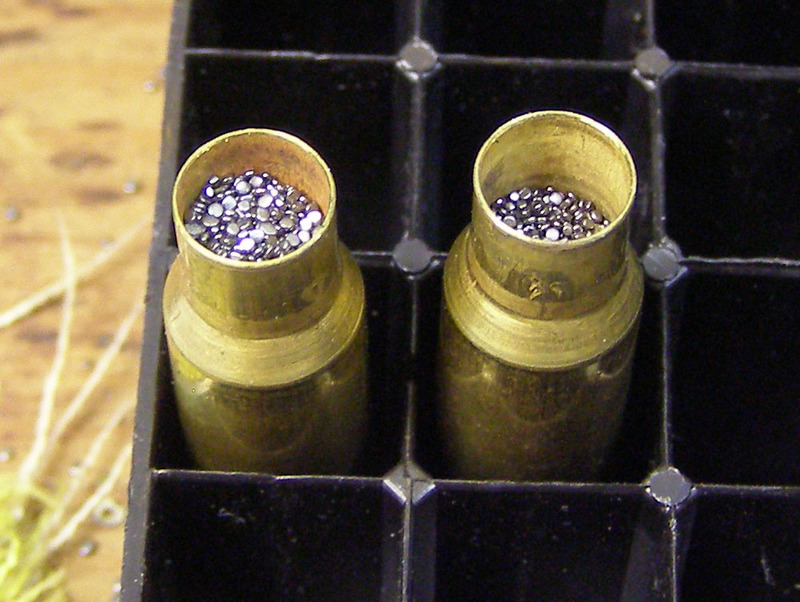 Below is a comparison of 36.5 grains of CFE223 in sized SSA brass. The one on the left was loaded via a funnel without the drop tube. I was impressed with the drop tube results on the right. I won't get to the range anytime soon. Old man winter rolled in last night. Yesterday was high 70s and today is low 30s with snow and ice pellets. Weather will be like that for several days. Posted: Sat Nov 23, 2013 11:20 am Post subject: Re: drop tubes, how do they work? Really surprised to see that much difference with a powder like CFE223. I think you have my interest. Let us know if the settled versus non-dropped loads show a velocity increase/decrease. As a follow on, would shaking the round after seating the bullet accomplish the same as using a drop tube? Posted: Sat Nov 23, 2013 12:32 pm Post subject: Re: drop tubes, how do they work? Posted: Sat Nov 23, 2013 2:28 pm Post subject: Re: drop tubes, how do they work? would tapping the side of full case settle it as much??? I know we tap/settle when using AR2206 in the 7.62x39 as the cases are nearly as full as what you have shown and its a chunky powder. Posted: Sat Nov 23, 2013 7:40 pm Post subject: Re: drop tubes, how do they work? The one on the left already had a couple of taps on it to settle the powder. I don't think putting in the bullet then shaking it will be ove any benefit as there wouldn't be much room left. I was impressed. I've got a lot more to lean but will look for any performance benefits. I've heard some claim that their SDs decreased and loads were slightly more accurate. I'm just glad to be able to fill the case with more powder without compressing it. Posted: Sat Nov 23, 2013 8:34 pm Post subject: Re: drop tubes, how do they work? Even with that, I have to use my tumbler to help settle down the powder. With tumbler running, place finger over case mouth and touch the tumbler with the base of the case for a few seconds. Problem solved. This is primarily with .223. Posted: Sat Nov 23, 2013 9:32 pm Post subject: Re: drop tubes, how do they work? All my "proper" loads are into neck sized cases & they hold significantly more H4831sc than those that are FL sized. Posted: Sat Nov 23, 2013 10:26 pm Post subject: Re: drop tubes, how do they work? Yes, full-length resizing does reduce case capacity. Thanks for reminding me of that English Mike. I may go back to neck sizing when I'm using the MagPro powder to reduce compressing the load as much.